The beautiful and inspiring Ballerina animated movie voiced by a stellar cast including Elle Fanning, Maddie Ziegler, Dane DeHaan and Carly Rae Jepsen will be playing in cinemas across Australia from January 12th 2017. Little Miss has been asking me if she can start ballet classes next year so I naturally jumped when I heard about Ballerina! I cannot wait to have a mummy daughter date at the movies with little Miss. She has never watched a movie at the cinema before as I was always worried she would want to leave half way through the movie but I have no doubt she will sit through this one as it looks fun and inspiring and all about ballet! This gorgeous new animated movie tells the story of a young orphan from Brittany called Félicie who has only one passion - dance. With her best friend Victor, who wants to become a great inventor, Félicie devises a crazy plan to escape the orphanage for Paris at a time when the Eiffel Tower was still being built! Félicie will have to fight like never before to surpass herself and to learn from her mistakes, to make her wildest dream come true: becoming a prima ballerina at the Paris Opera. Ballerina dances into cinemas January 12, you can watch the trailer below. Little Miss hasn't stopped wearing her tutu and necklace since we received ours and her dance bag will be perfect when she starts ballet next year. Please note: Due to the Christmas holidays, prizes will arrive after Christmas. If for some reason, your prize parcel hasn't arrived by January 6th please email us at busycitykids@gmail.com. 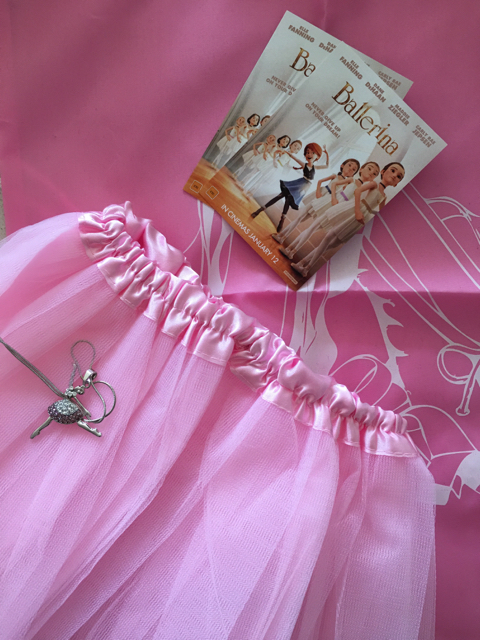 For more information about Ballerina the movie, head to the movie's dedicated website.